Deal Of The Week – 1080P Sports Action Camcorder "Amphibious"
Only 10 days left to get this deal of the week! 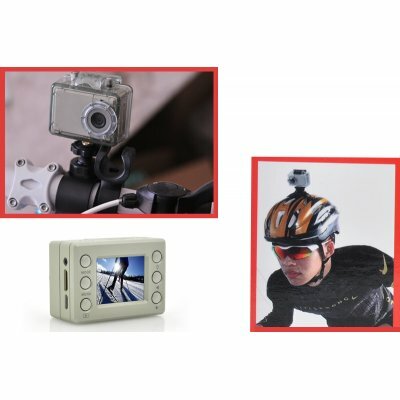 Do you want to have a terrific action camcorder for capturing video of extreme sports, individual sports or family activities? Well, no matter you are a snow skier, mountain biker, scuba diver or mountain climber, this action camcorder “Amphibious” from Chinavasion will help you to record everything on-the-go without missing any of the action. Feauturing a 1.5 Inch TFT Screen, 1080P Resolution, 5MP Still Images and Waterproof Casing, the Sports Action Cam “Amphibious” is definitely the greatest camcorder for you. And with 29% off the original wholesale price, this is the perfect time for you to hit “Add to Cart” now. 1.5 Color LCD Screen – With this screen, you can see your fantastic photos and videos and also view exactly what you are capturing. 1080P Resolution – The action camcorder “Amphibious” can record in high definition and take high quality photos when you are mountain biking or diving in the depths. 5MP Still Images – With the 5.0 Mega CMOS Sensor, you can capture a lot of sharp and crispy images which will easily bring back the memories of the time you took them. Waterproof Casing – Coming with a waterproof case, you can take the “Amphibious” up to 30 meters in to the deep blue sea without the risk of becoming damaged. Check out the Deal Of The Week – 1080P Sports Action Camcorder “Amphibious” right now!